All the workshop resources are available in the SADL Moodle course. Description: The first workshop will be a chance for the Ambassadors to meet each other and the SADL team, and have a conversation about the kinds of skills students need to excel in their studies. Ambassadors will discuss how to find and evaluate information for their studies and for their social lives. 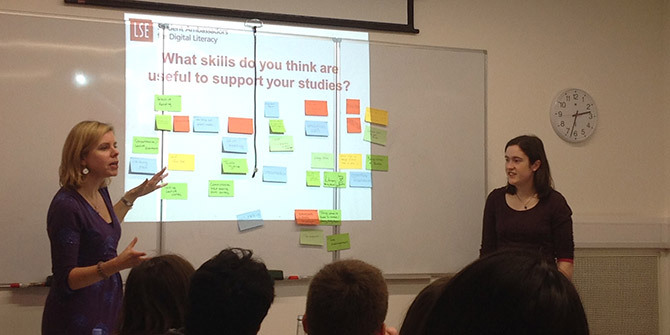 Group work – Ambassadors will work in groups to discuss the digital and information literacy skills they find useful to have on their courses, and consider the differences in skill sets required by their peers in their department. Ambassadors will think about how to evaluate the quality of the information they find online, and how to spot spoof websites. They will also review the value of different types of information sources. The SADL group project will be introduced and students will be supervised by a Senior Ambassador to explore one of three topics: improving learning spaces at LSE, improving feedback and assessment and the role of peer learning. Description: This workshop will cover how to use reading lists and strategies on how to use readings effectively. Will will also cover how to use tools to faciliate note taking, and getting organised. Description: This workshop will explore how students currently store, share and use information that they find for their studies. We’ll discuss ideas our ‘information behaviour’ and look at some tools that can help, depending on our ways of working. The team will share their favourite tools and there will be a chance for the ambassadors to share ideas with each other. We’ll finally think about academic integrity – sharing is important but students must be mindful of plagiarism. What is plagiarism – a quiz! Description: This workshop will look at how to manage your digital identity and footprint through social media. We will look at aspects of digital identity including networking, producing online media, online security and your online image. As this is the final workshop, we would also be reviewing some of the concepts we’ve covered throughout the project. We hope to capture some feedback from the Ambassadors through short video clips and will provide some guidance on creating video. Learning how to interview other people to collect information from them and how to use cameras and voice recorders for the SADL group project.